A research team of botanists have discovered Narrow-lipped Butterfly-orchid (P. micrantha) which was last seen in 1844. This species of orchids was found in the highest volcanic ridge on the central island of São Jorge in the Azores islands. Previously, there were only two species of orchids known to inhabit the Azores and the discovery of this third butterfly orchid, which was documented by German botanist Karl Hochstetter 173 years ago and never seen again, urgently requires conservation recognition. The Hochstetter's Butterfly-orchid is threatened by habitat destruction and invasive alien plants. The Azores is made up of nine volcanic islands in the middle of the northern hemisphere of the Atlantic Ocean. It is situated west of Portugal (around 1,360 kilometers or 850 miles). It is also 1,510 kilometers (940 miles) northwest of Morocco, and about 1,925 km (1,196 mi) southeast of Newfoundland. The islands were formed through volcanic and seismic activity around 8 million years ago during the Neogene period. Each of the nine islands have unique and distinct geomorphological characteristics which sets it apart from each other; ranging from Corvo which is a crater formed from a major Plinian eruption to the almost circular Terceira which has one of the largest craters in the region. The largest island is São Miguel which has many large craters and fields of spatter cones. Researchers studying speciation of butterfly orchids on the Azores have been startled to discover that the answer to a long-debated question "Do the islands support one species or two species?" is actually "three species". Hochstetter's Butterfly-orchid, newly recognized following application of a battery of scientific techniques and reveling in a complex taxonomic history worthy of Sherlock Holmes, is arguably Europe's rarest orchid species. Under threat in its mountain-top retreat, the orchid urgently requires conservation recognition. 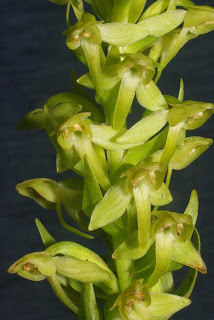 A lavishly illustrated publication, titled "Systematic revision of Platanthera in the Azorean archipelago: not one but three species, including arguably Europe's rarest orchid", was published today in the peer-reviewed open-access journal PeerJ. The research team, led by independent botanist Prof. Richard Bateman in collaboration with local botanist Dr. Mónica Moura (University of the Azores) and plant morphologist Dr. Paula Rudall (of the Royal Botanic Gardens Kew), originally viewed these butterfly-orchids as a simple, tractable system ideal for studying the origin of species and so they initiated a focused exploration of all nine Azorean islands. A combination of field and laboratory research soon showed that butterfly-orchids first colonized the Azores from the Mediterranean rather than from North America, rapidly undergoing miniaturization of their ancestrally large flowers. It proved easy to distinguish the widespread Short-spurred Butterfly-orchid (Platanthera pollostantha) from the rarer Narrow-lipped Butterfly-orchid (P. micrantha) using morphology, DNA sequences, and the identities of mycorrhizal fungi associated with the roots of the orchids. However, this 'simple' study was thrown into disarray when Dr. Moura explored remote dwarfed laurisilva forests along the highest volcanic ridge on the central island of São Jorge and found an unusual population of butterfly orchids. "I immediately recognised the flowers as being exceptionally large for an Azorean butterfly-orchid," said Moura" and e-mailed images to Richard Bateman for confirmation that they were new to science". Data gathered subsequently in the laboratory using several analytical techniques all pointed to the discovery of a new species, and suggested that the species – named Platanthera azorica in the PeerJ paper – originated relatively recently by a remarkable restoration of the large-flowered morphology of its presumed mainland ancestor. Bateman then realised that this "new" orchid had in fact been illustrated (but never correctly identified as a new species) in the first ever Flora of the islands, published in 1844, but thereafter had consistently been confused with other more frequent Azorean species. The illustrated specimen, deposited in the herbarium at Tübingen by German botanist Karl Hochstetter, was collected during his tour of six of the nine Azorean islands in 1838. However, as Hochstetter did not visit São Jorge (where P. azorica was most recently 're-discovered') it is entirely possible that the population he originally described may remain to be discovered on another Azorean island. In the meantime, the team are anxious to obtain conservation protection for the newly-recognized and exceptionally rare orchid. "This remarkable species languished unrecognized for 173 years," commented Bateman. "It's rediscovery and recognition beautifully illustrate the value of integrating field-based and laboratory-based approaches to generate a modern monograph. This methodology both demonstrates that the species is genuine and allows us to make informed recommendations for its future conservation."